Self-assembly is the process by which individual building blocks—at the smallest level, atoms—spontaneously form larger, complex structures. The structures they form depend on the size and shape of the building blocks, and on the conditions to which these building blocks are exposed. This can be demonstrated quite simply using breakfast cereal, or for slightly more complex cases using specially prepared Legos. Understanding how particular kinds of building blocks interact under a variety of conditions is useful for scientists who want to develop new materials with novel properties. Self-assembly allows researchers to synthesize such materials much more rapidly and easily than other methods, since the behavior of atoms at the nanoscale can be controlled by manipulating conditions at the macroscale. 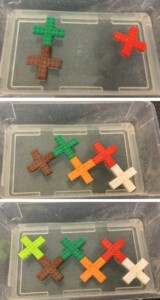 To prepare the Legos: Begin by supergluing four 2x3 Lego bricks around one 2x2 brick to create a "plus sign" shape. Repeat until you have at least 4-8 plus signs, leaving some 2x2 bricks unattached. 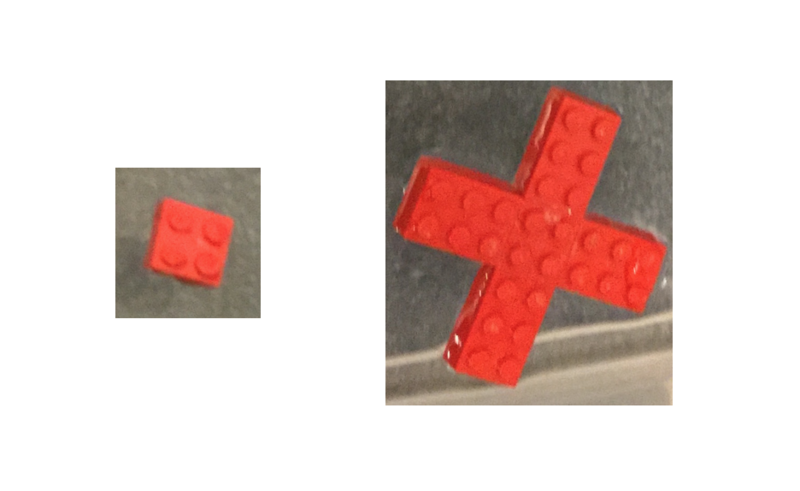 2x2 Lego brick (left) with four 2x3 Lego bricks affixed (right). Next, superglue magnets to the inside surfaces of all four sides of the remaining the 2x2 bricks, and of the four ends of the "plus" signs. Pay attention to the polarity of the magnets: For the simplest case, all four magnets glued into a particular 2x2 brick or "plus" sign should have the same polarity (i.e., should repel one another). After all magnets have been attached, spray foam in the hollow bottom of the Lego. This will allow the Legos to float in water. Fill two plastic tubs with approximately 2 inches of water. Add cereal, slowly at first, to the first bin. While gently shaking the bin, add more cereal. Observe the effects. More vigorous shaking simulates the movement of atoms at higher temperatures. 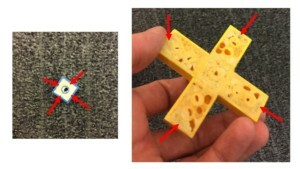 Temperature affects the forms of self-assembly a particular material may undergo. Add the unattached 2x2 Lego bricks to the second bin. Gently shake the bin and observe the effects. 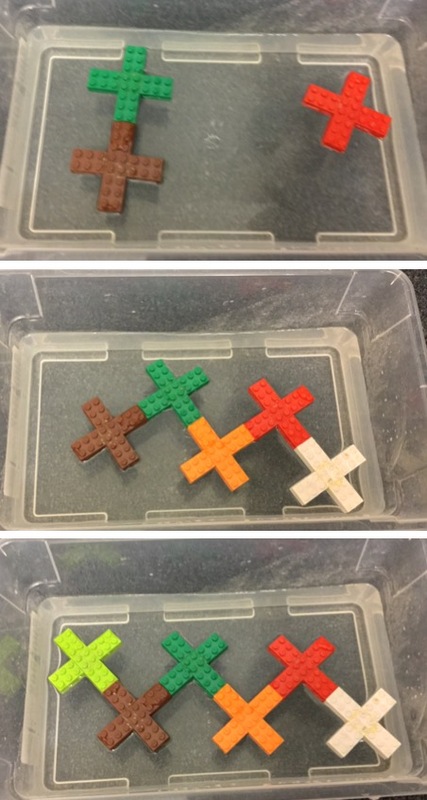 Predict what will happen when the Lego "plus" signs are used. Repeat Step 5 using the Lego "plus" signs. 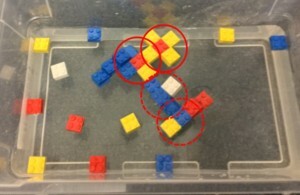 For more advanced experiments, you can systematically vary the polarity of the magnets in particular positions inside some Legos, observing the effects of these changes. You can also combine building blocks of different shapes—for example, mixing the 2x2 Lego bricks with the Lego "plus" signs or other Lego shapes, or using different kinds of cereal—to see how this will affect the self-assembly process and the optimal arrangement of the building blocks. All instances of self-assembly, whether of Froot Loops, Legos, large molecules like DNA, or individual atoms, depend on two things: the size and shape of the building blocks, and the rules governing their interactions. 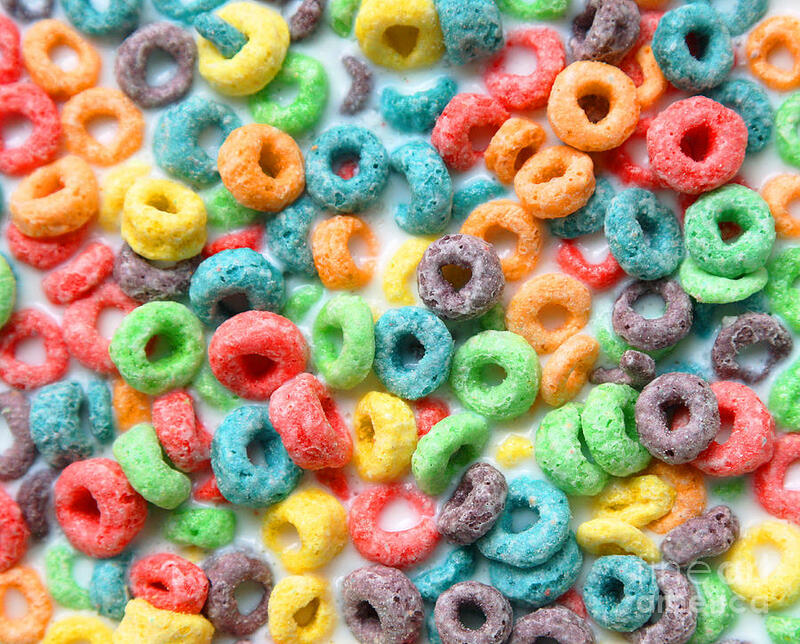 In the first case described here, using ring-shaped cereal, there is only one rule: attraction between all rings. According to this rule, the most stable or "optimal" arrangement of the rings is the one in which each ring as is close as possible to as many other rings as possible. This is what physicists call a "packing problem"; here, the solution or most stable arrangement is obtained when each ring is surrounded by six other rings. 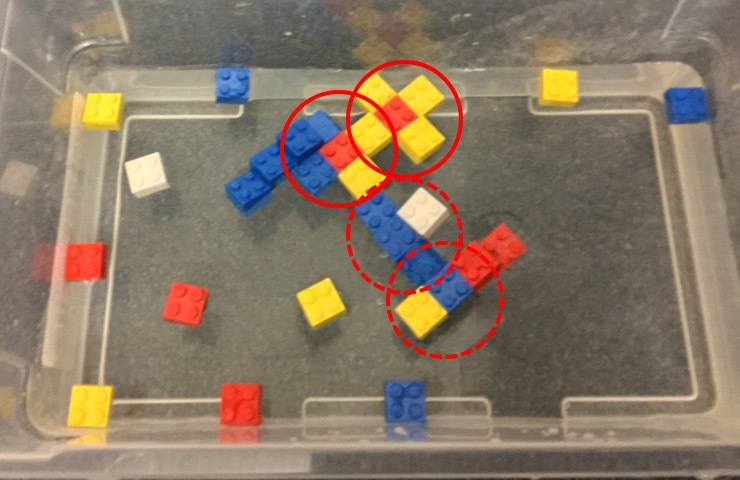 In the case of the Legos, there are two rules guiding self-assembly: attraction between some Legos and repulsion between others. In addition, the building blocks are square or plus-shaped rather than circular, which in turn affects their optimal arrangement. Floating the building blocks in water allows them to move freely, which is important for all self-assembly processes. Shaking the bin simulates the random (Brownian) motion of atoms and molecules, and more vigorous shaking simulates the more rapid movement which occurs at higher temperatures.